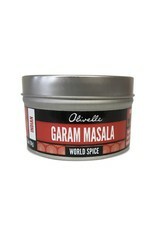 Indian Garam Masala - Miam! Originating in Northern India where the winters are cold, Garam Masala directly translates into “hot mixture” referring to the spices ability to “heat” the body. A staple in every Indian kitchen, this spice blend adds depth to everything from meats and soups to eggs and veggies.